The Brain Movies series gathers Ellison’s screenplays into collections reprinted from the author’s own file copies. See how Ellison originally imagined the many television episodes that were mangled after they left his typewriter en route to the small screen. Enjoy unprecedented access to Ellison’s writing process by studying his handwritten annotations or comparing outlines to finished scripts. Experience undiluted Ellison in the theater of your own mind, where no network executive, scissor-happy censor, or unimaginative director can come between you and the storyteller. 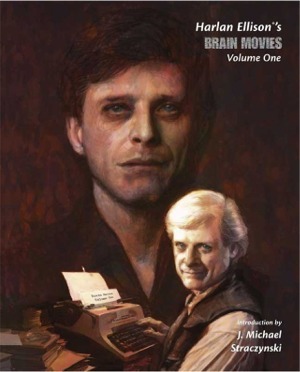 Brain Movies collects Harlan Ellison’s television work. Reproduced from Ellison’s private files (and occasionally featuring his hand-written alterations), these scripts appear exactly as they did when the writer pulled them from his Olympia manual typewriter. “Touching Magic”—An introduction by J. Michael Straczynski, creator of Babylon 5 and writer of the Clint Eastwood-directed film Changeling, in which he describes the importance of seeing actual script pages as the author originally wrote them. “Memos From Purgatory”—Ellison’s adaptation of his memoir about life in a Brooklyn gang. Produced for The Alfred Hitchcock Hour, this harrowing tale of juvenile delinquency is presented in TWO different drafts—one with Ellison’s extensive hand-written revisions—illustrating the author’s creative process. Two stories from The Outer Limits —”Soldier,” the story that inspired the Terminator movie franchise, and the Writers Guild Award-winning “Demon With a Glass Hand,” one of the most iconic segments of the 1960s science fiction anthology. Ellison won yet another Writers Guild Award for “Paladin of the Lost Hour,” an episode of the 1985 Twilight Zone revival written simultaneously with the Hugo Award-winning short story of the same name (featured in Harlan 101), but this particular script differs from the story in one key respect: it features the original ending Ellison planned for this classic story. This lost ending hasn’t been seen since his colleagues in the Zone writer’s room convinced him to write the conclusion that has since become famous. The original outline for the story — remarkably reminiscent of the short story in its execution — is included as well. After leaving his post as creative consultant on The Twilight Zone, Ellison penned one more episode at the behest of the series’ new script editor, J. Michael Straczynski, and that was “Crazy as a Soup Sandwich,” presented here for the first time with the treatment from which the teleplay was developed. The final script is “The Face of Helene Bournouw,” and if you’ve only seen the episode of Showtime’s anthology series The Hunger that bears that title, you’ve merely seen the vulture-picked bones of Ellison’s adaptation of his own chilling short story. See why Harlan had the TV episode credited to his pseudonym, Cordwainer Bird, in a script that — effectively — will be seen for the first time in this volume. Featuring a beautiful cover portrait of Ellison by artist Iain McCaig, best known for his work on the Star Wars and Harry Potter franchises.